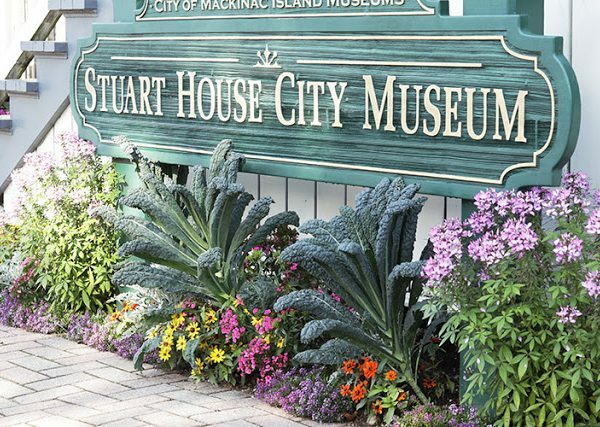 There’s something special going on at a little island smack dab at the meeting point of Lake Michigan and Lake Huron. 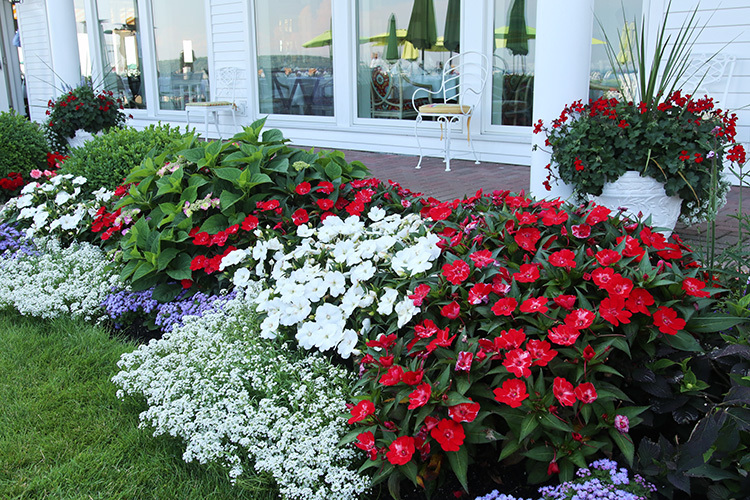 I’ve never been to a place outside the tropics where a garden can be filled with every color and have it work like it does on Mackinac Island. The air there is clear, the skies seemingly always deep blue. It’s like living in a Kodachrome slide, if you are of an age to remember good ol’ Kodachrome. 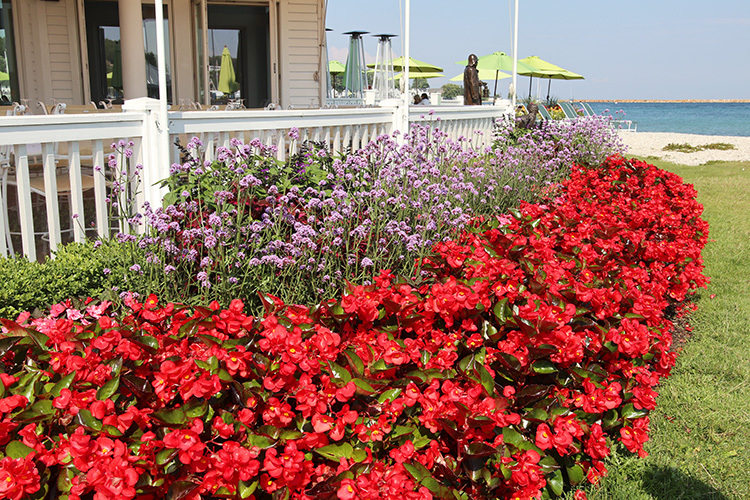 I don’t think the gardens of Mackinac Island could work in a lot of other places. 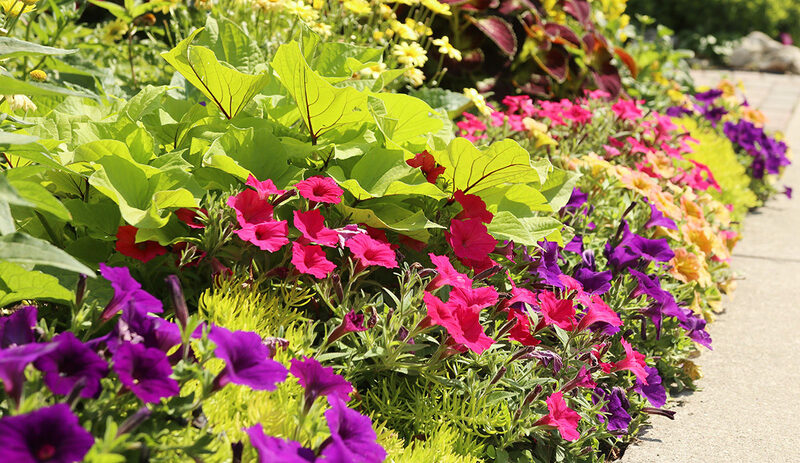 It’s a tourist destination that is all about color and making people happy, so that’s certainly part of it, but I also think the short gardening season accounts for some of the color as well. 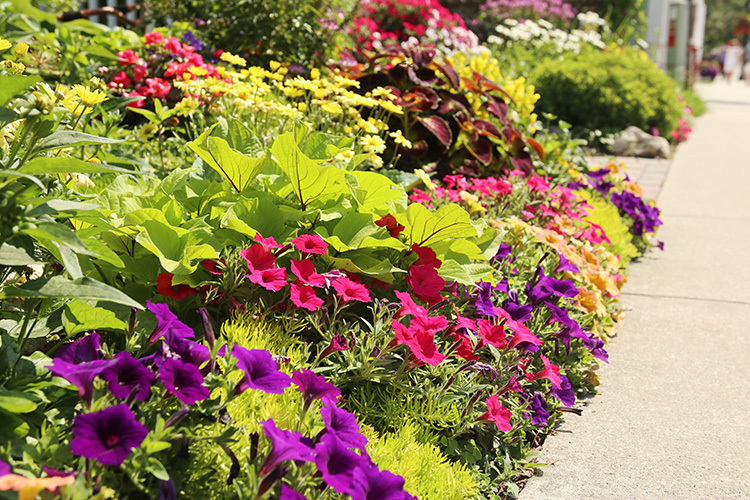 Much of it is provided by annuals because gardens need to look good quickly and stay looking good until Labor Day or so. 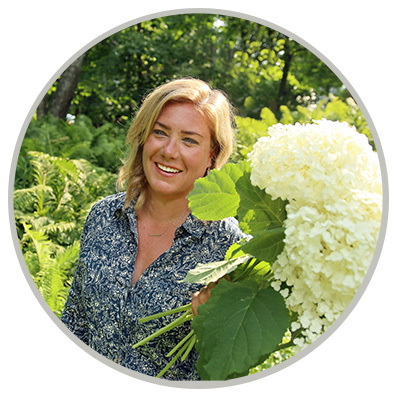 And, frankly, there isn’t a large population that lives on the island year round so winter interest isn’t as much of a consideration, especially in the downtown area where I usually take my very own garden tour. I still love checking out the gardens. 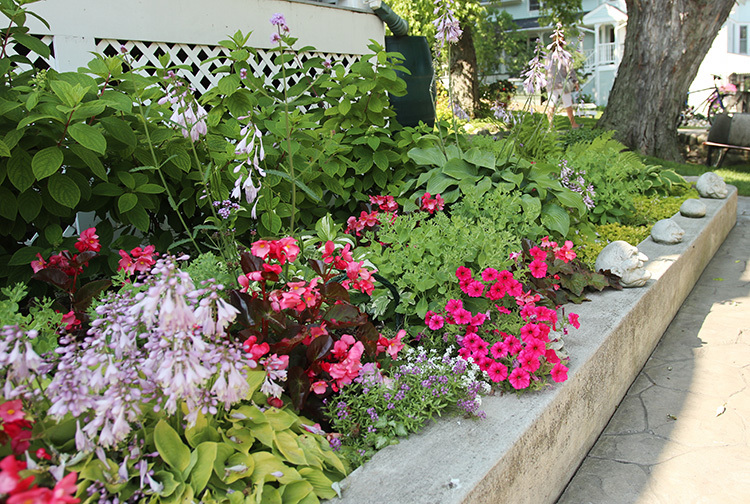 I always take away ideas I’d like to incorporate, either about color combinations or new plants or even garden structure (the small terraced beds I built were directly influenced by gardens on Mackinac Island). I’ve been to Mackinac Island once a summer for the last 30 years and a few others before that. In the past few years I’ve made an attempt to get up early, when the sun is less harsh and before the first ferries of the day bring hordes of people from the mainland, but it was a rough trip to the island this year (and sadly one that was tragic for one sailor in the race that takes me there), and, well, I slept in. So the photos are a little bright and there are a few people in the background. I also didn’t get to some of the areas that are a little farther afield (OK, up a hill I just didn’t feel like tackling), but it’s still worth a dive into the land of colorful gardens. A few steps off the sidewalk lead to this walkway, which makes for an interesting vantage point. The large green shrubs are Fine Line buckthorn. 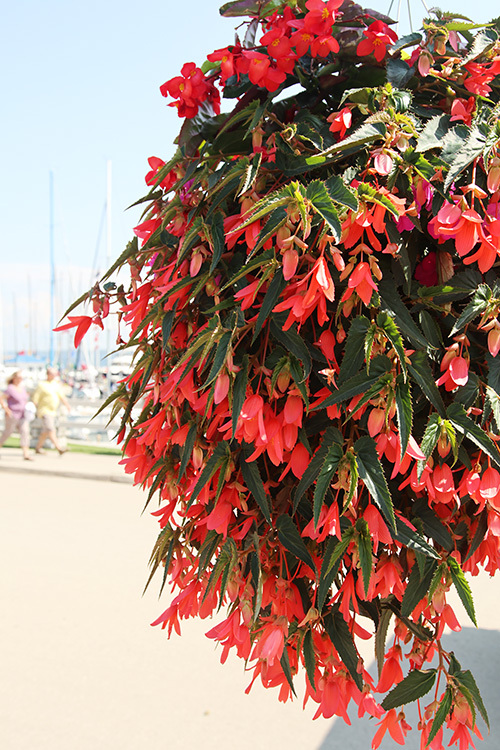 Almost all the downtown hanging baskets featured this begonia. It was pretty stunning. 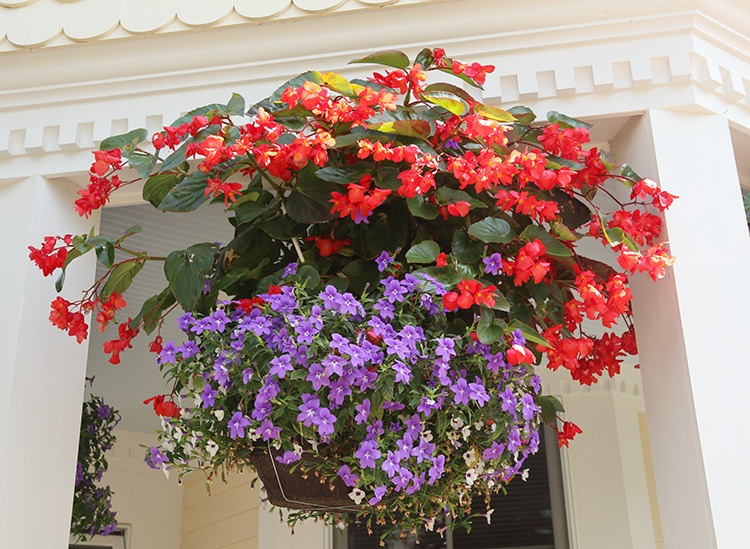 This hanging basket in a shadier spot at a bed and breakfast caught my eye. See what I mean about color? 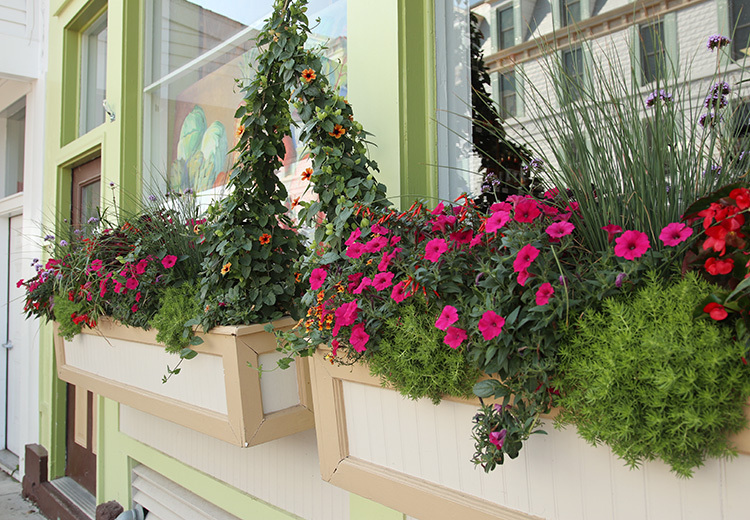 This walkway garden wouldn’t work in a lot of places, but it certainly does here. I dare you to find a cuter post office on the planet. 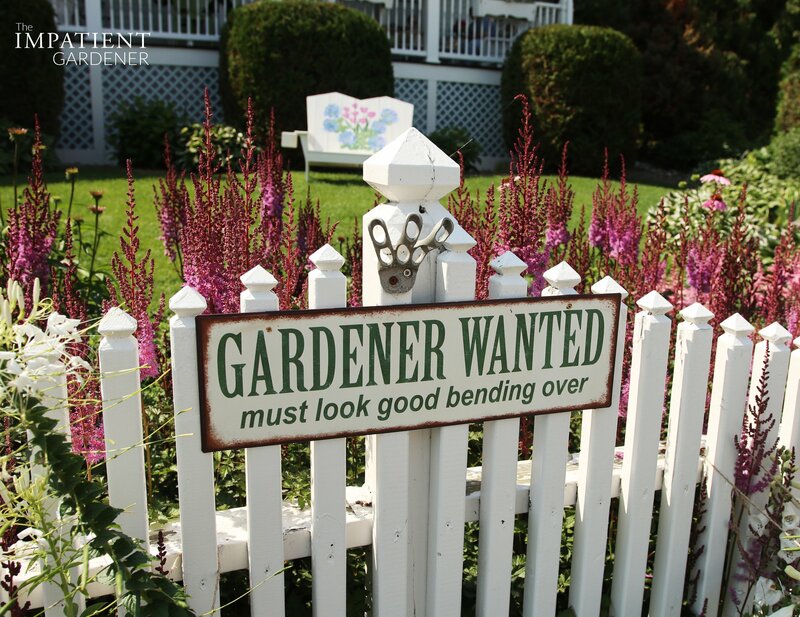 I take a shot of this fence and garden every year. It always has a pink color scheme. And someone here has a good sense of humor. 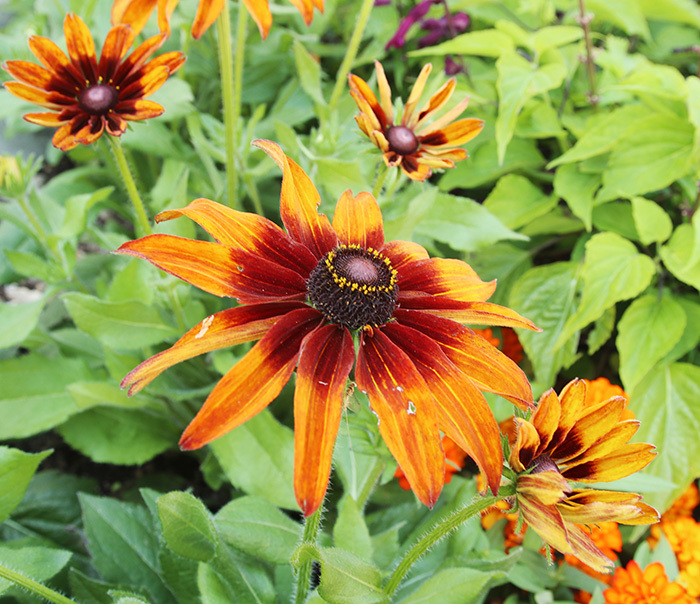 It’s not just the businesses and professionally maintained gardens that put on a show. 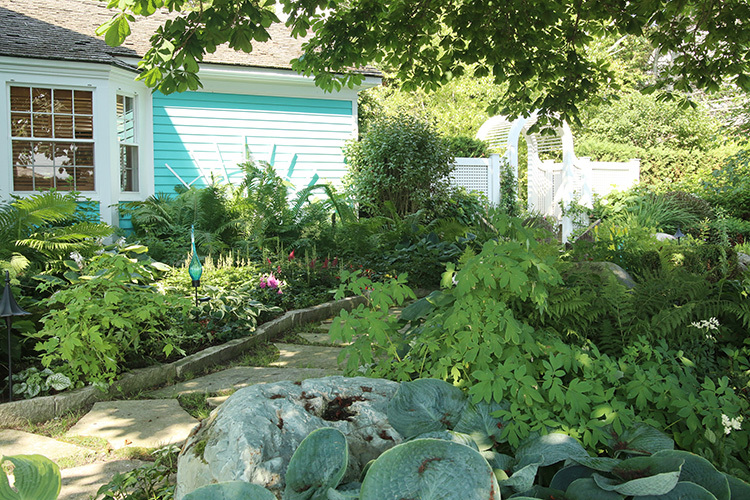 This is a private garden along an alley. 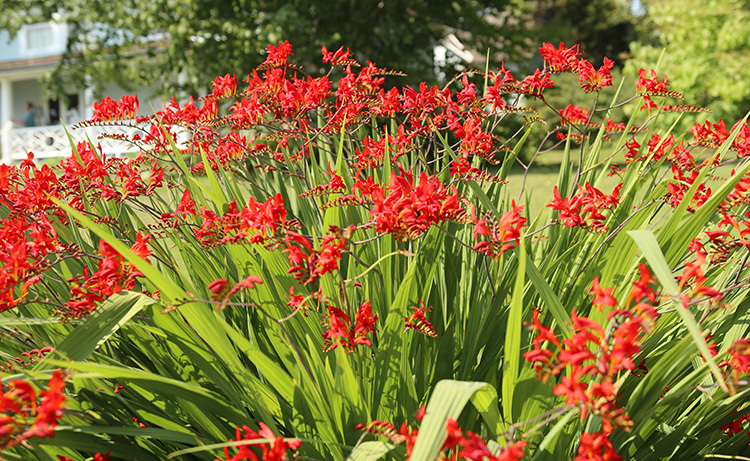 The USDA hardiness zone map says that Mackinac Island is in zone 5a, but this huge stand of Crocosmia (I assume it is ‘Lucifer’, which is theoretically hardy to zone 5 but can be highly temperamental) in a private garden has me thinking there is a moderating effect from its lakeside location. But I’m definitely going to give it a try. 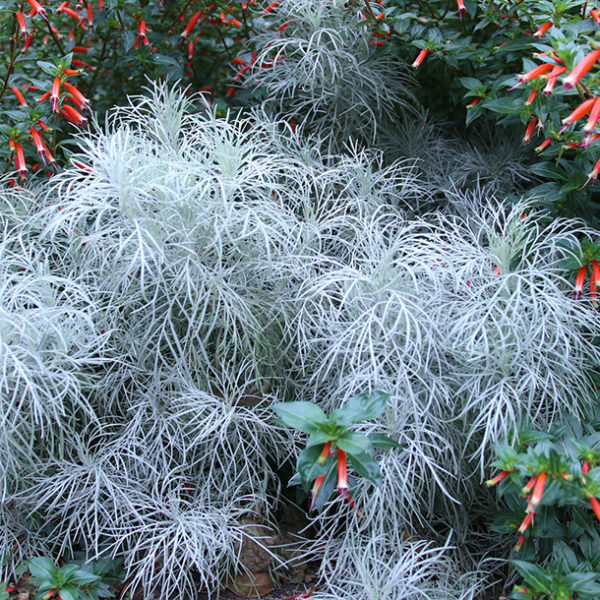 This was one of the most eye-catching plants I’ve seen in a long time. 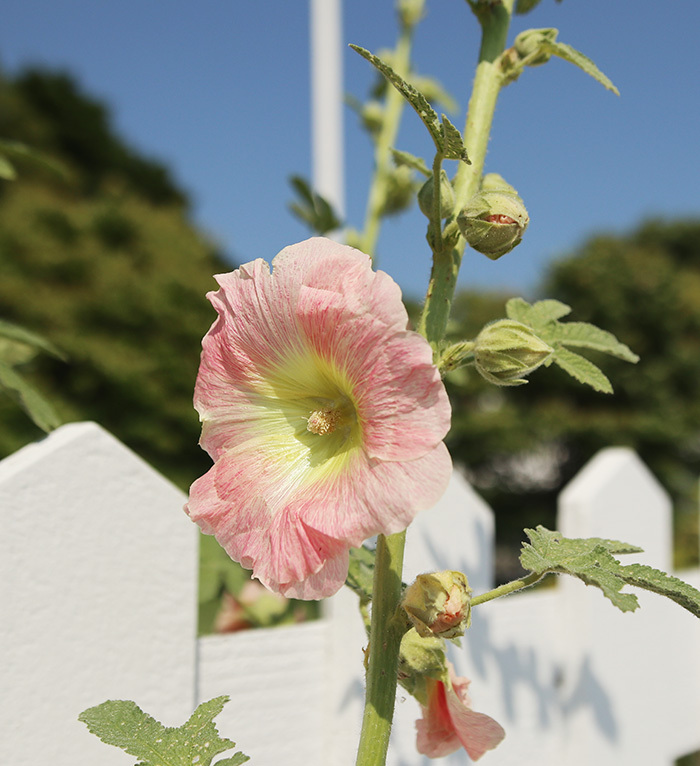 And right next to it was this perfect hollyhock. 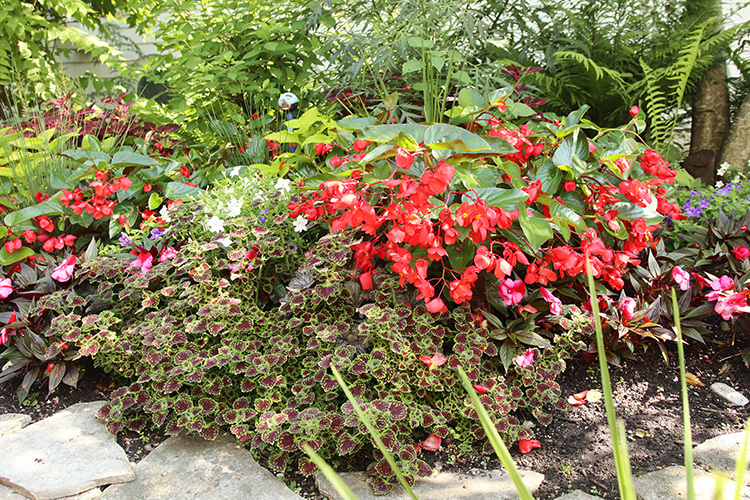 I liked the nasturtium border in this home garden. This shady walkway was charming. 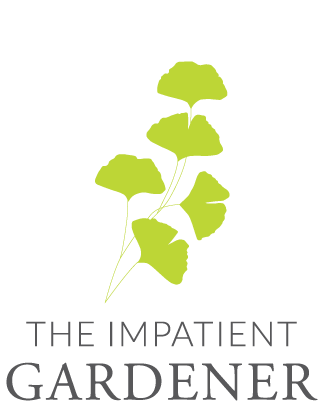 Garden designer Jack Barnwell did a video tour of this garden from the Grand Garden Show last year. If I can find a link, I’ll add it. This was my annual reminder to stop discounting astilbes as really good garden plants. 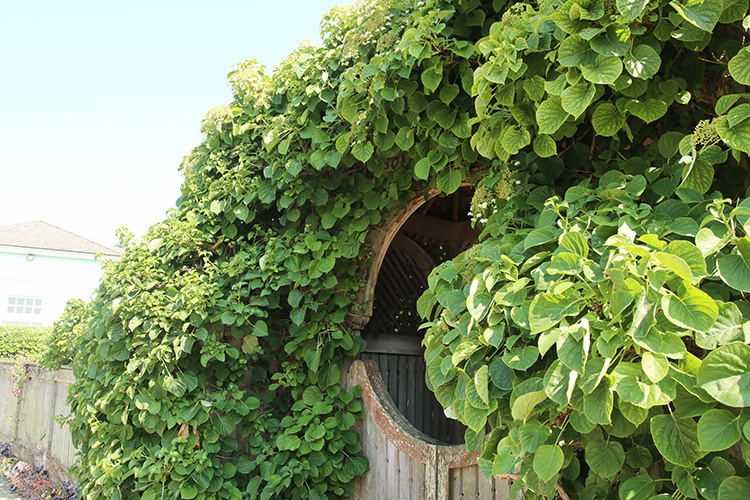 I take a picture of this climbing hydrangea arch every year. This year you’re getting two pictures of it because it’s just that good. 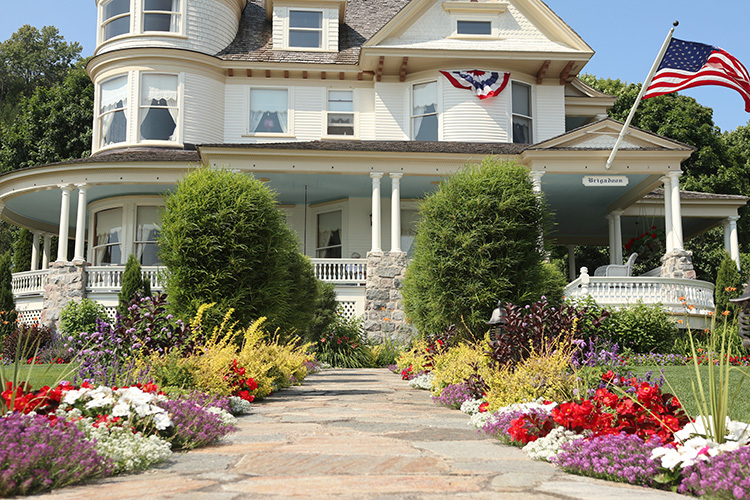 The Iroquois Hotel is where garden designer Jack Barnwell spares no color. 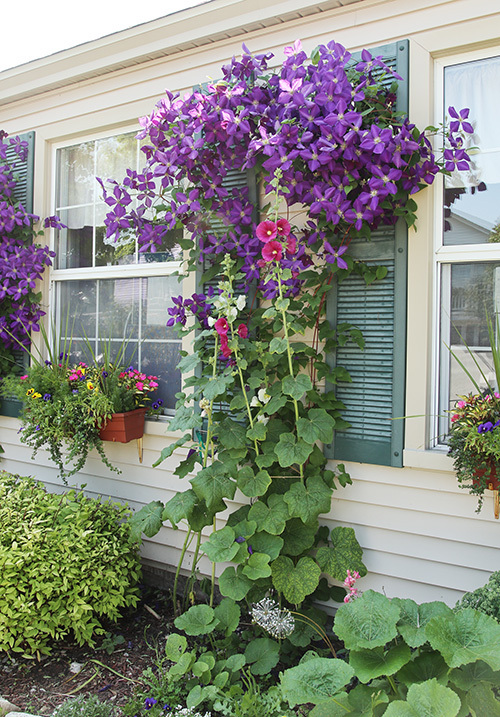 Combining thousands of annuals he creates new looks every year. 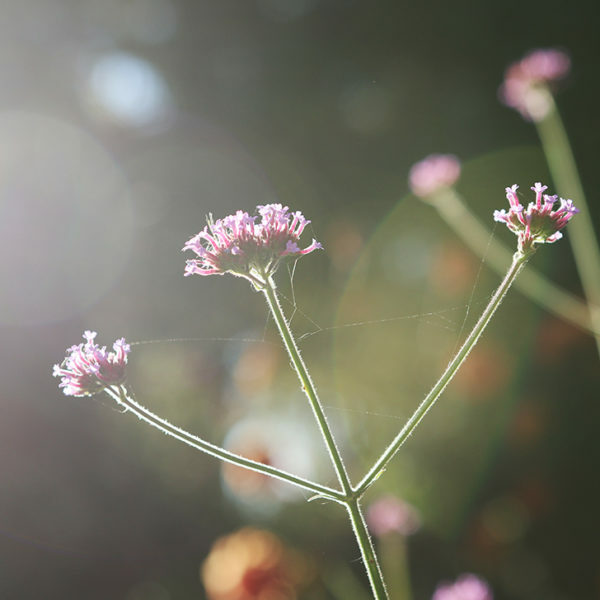 This combination of Surefire begonias and Meteor Shower verbena is certainly bold. 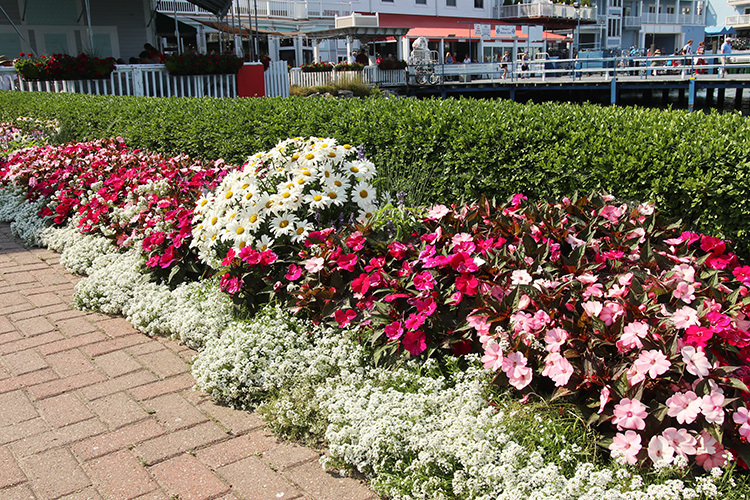 The view to the ferry dock is planted in pinks. Another bed near the dining area is red, white and blue. These lilies stopped me in my tracks. I’ve reached out to Jack to tell me what they are but I’ve not heard back yet. If you have guesses, let me know. I need them! This plant combination caught my eye. 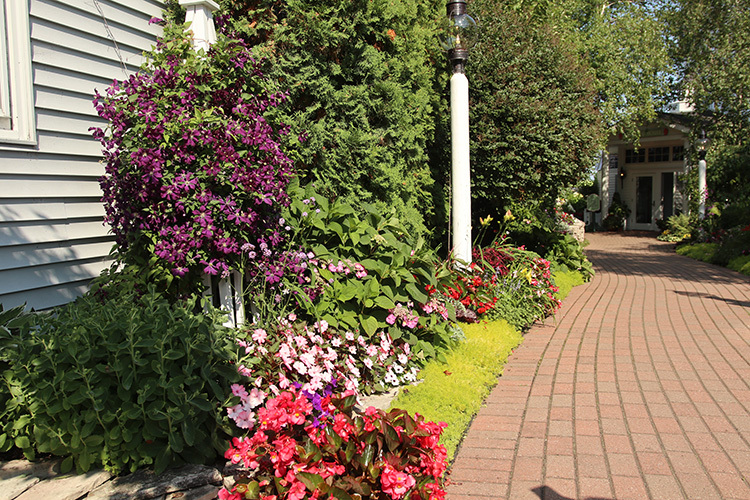 The walkway to the hotel’s restaurant is always inviting. 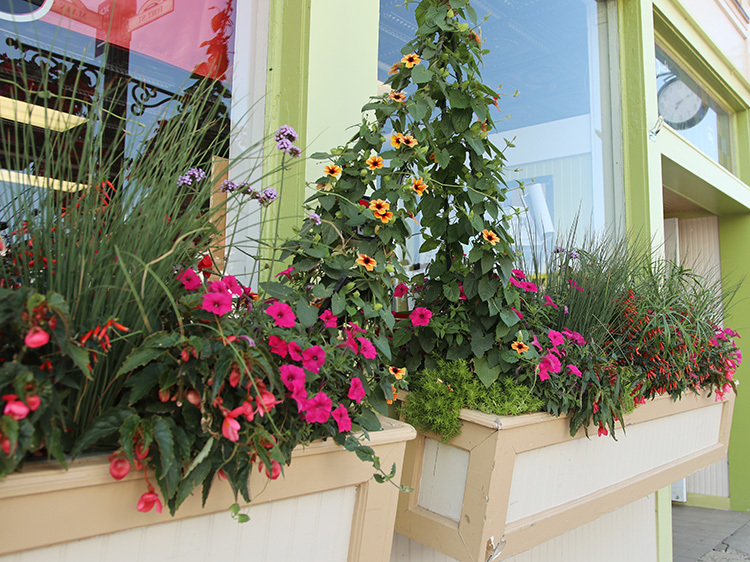 The window boxes outside the grocery store are always fun. Jack Barnwell designs these as well and he’s been doing the Thunbergia vines to bridge the boxes for a few years. I can see why he sticks with it: It works. 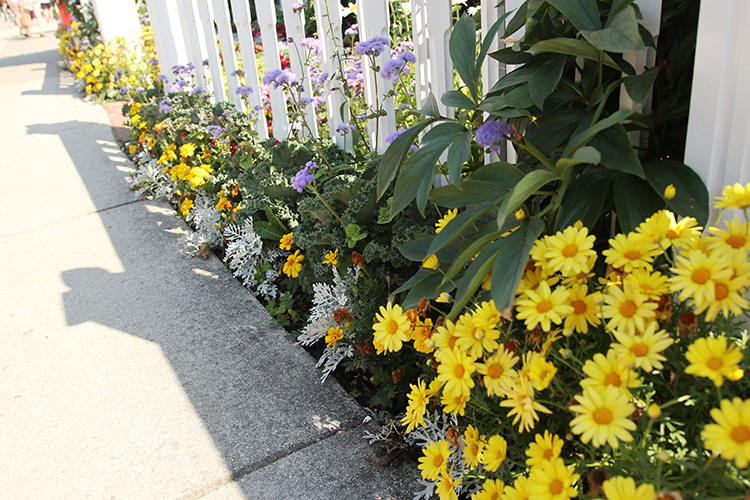 I always love how the tiny strip of the sidewalk side of the fence is planted outside this bed and breakfast near the marina. It never fails to make me smile. 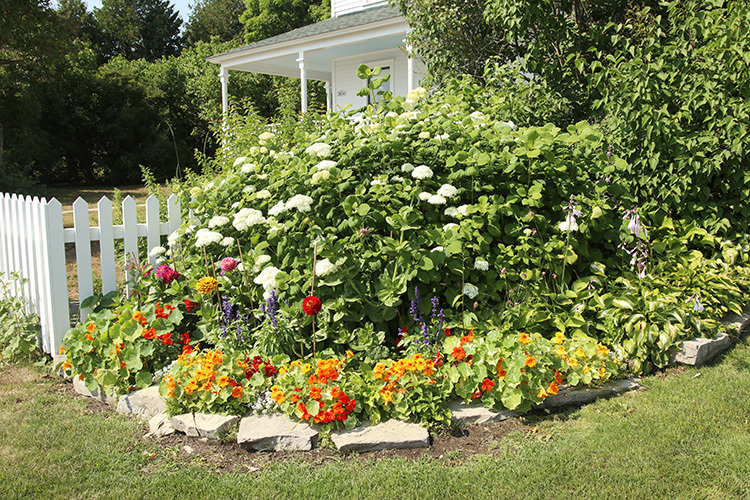 Many of these gardens have appeared in my other posts about Mackinac Island and it can be fun to see how they are different from year to year. Here are some posts to check out to see more. 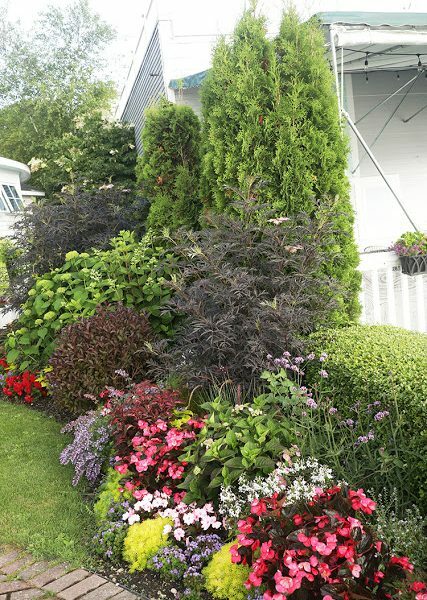 If you are interested in a behind-the-scenes look at some Mackinac Island gardens, the Grand Garden Show is held every year in late August. It is always fun to see your pictures of the annual bonanza at the Island. They are an inspiration. Oh, M. Island has been on my bucket list for a long time. This is almost cruel (in a nice sorta way.) 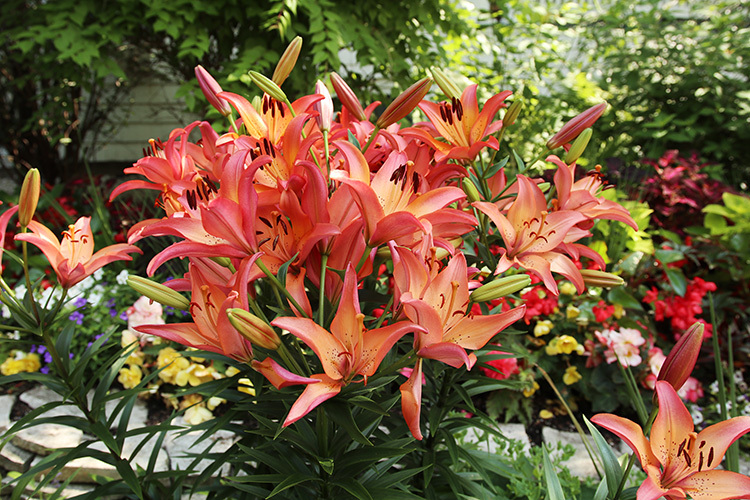 What are the red and white flowers in photo above your lilies? I am as bad at remembering names of flora as I am w/ people. Glad you slept in & hope you had a good slow cup of coffee upon waking. 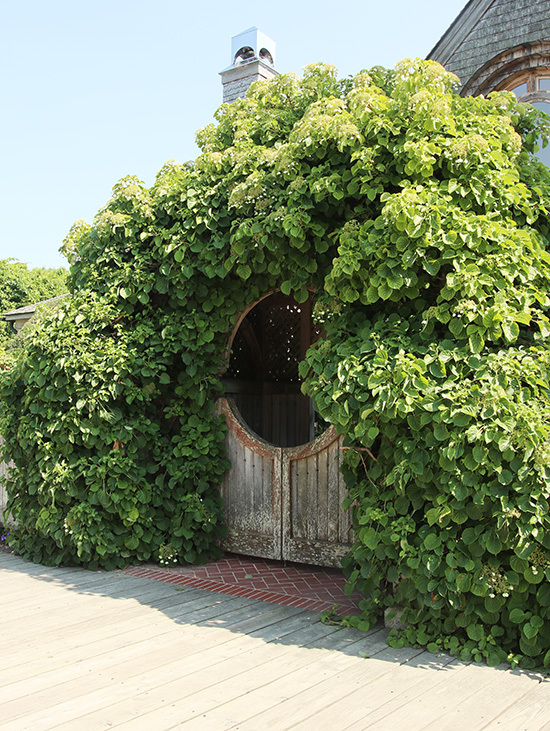 That Hydrangea arch is jaw-dropping. 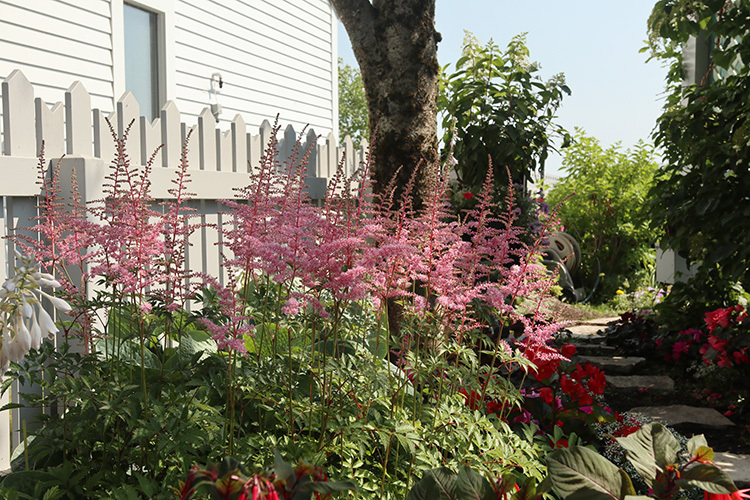 If you have the right conditions Astilbes are great. I finally seem to have sited them properly and am definitely enjoying them. 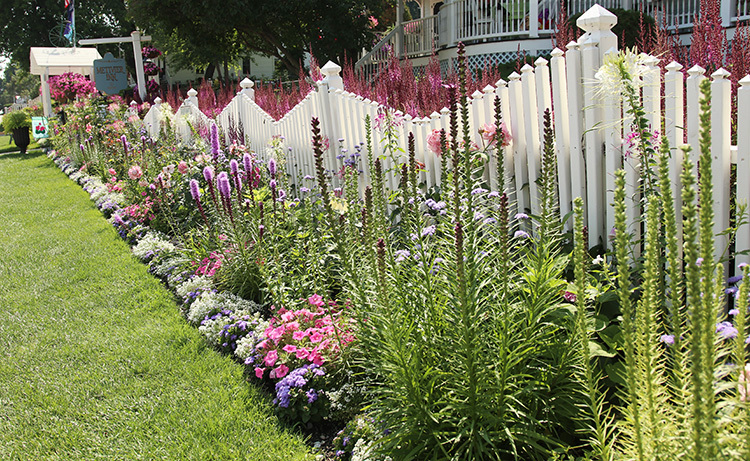 The pink ones by the pickett fence are gorgeous. Thank you for that! It’s a stunner. Glad you found the blog.